Make this the centerpiece of your Easter lunch. 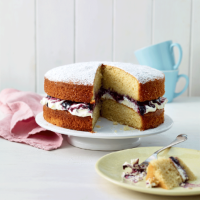 The hint of zesty lemon, and floral and fruity blueberry jam make a delicious flavour combination. 1. Preheat the oven to 180ºC, gas mark 4, and grease and line two 20cm sandwich tins with baking parchment. Place the sugar and Stork in a large mixing bowl. With an electric whisk or wooden spoon, beat together until pale and creamy. Next add the eggs, one at a time, scraping the bowl down after each addition. 2. Fold in the flour in two additions, then lastly fold through the lemon zest and vanilla. Pour into the prepared tins and place in the oven for 22–25 minutes or until a wooden skewer inserted into the centre comes out clean. Allow to cool in the tin for 5 minutes, then transfer to a wire rack to cool completely. 3. Once the cakes are completely cool, pour the double cream into a mixing bowl and whip until soft peaks form. Spread the cream over the bottom of one of the sponges, spread the other sponge with jam, and sandwich them together. Finish with a dusting of icing sugar just before serving. Cook’s tipInstead of whipped cream, a vanilla-scented buttercream is a lovely alternative and is great if you want your cake to keep until the next day. Simply cream together 150g Stork With Butter with 150g icing sugar and a teaspoon of vanilla extract.